Just wanted to post about a few random things tonight. First and foremost, a big happy birthday wish to my husband, Tony. 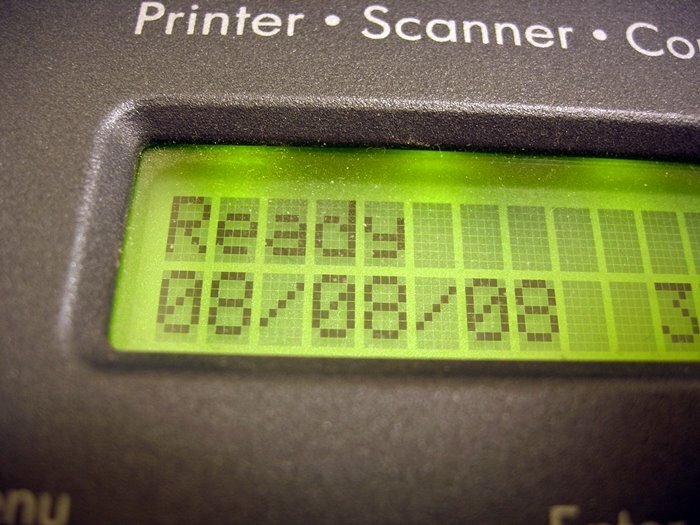 Rewind to Friday … 08.08.08. What a cool date, eh? I can’t imagine how many people got married on that day. Wouldn’t it be cool if your baby was born on that date? I have always had this weird fascination with numbers. Anyway. Moving on now. My coworker, Donesia’s, birthday was on Friday so she got to celebrate a fun 08.08.08 birthday this year. I made this card for a bunch of us at the office to sign for her using a Stampin’ Up! stamp that Liz gave to me with my last order (thanks, Liz!). I am really into the idea of using large, decorative stamps as backgrounds these days. I love how the foam letter stickers stand out on this card. I’m also really diggin’ this pink and blue combination for some reason. I just think it goes so well together, so I made Liz a thank you card to thank her for the flower stamp (silly, I know!). 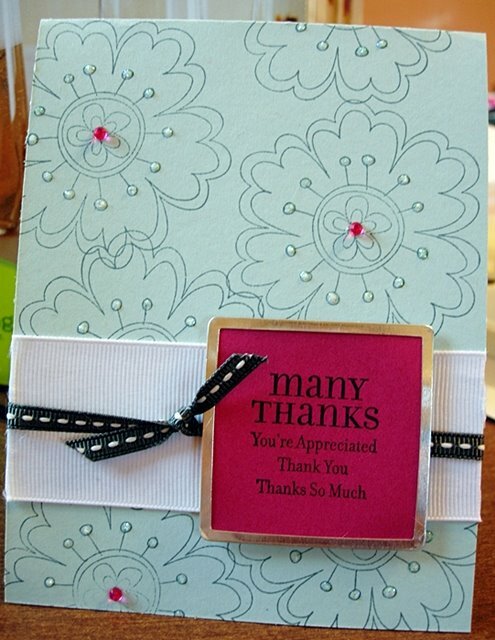 Renee loaned me her Making Memories tag maker tool, so I used it around the stamped “many thanks” image. 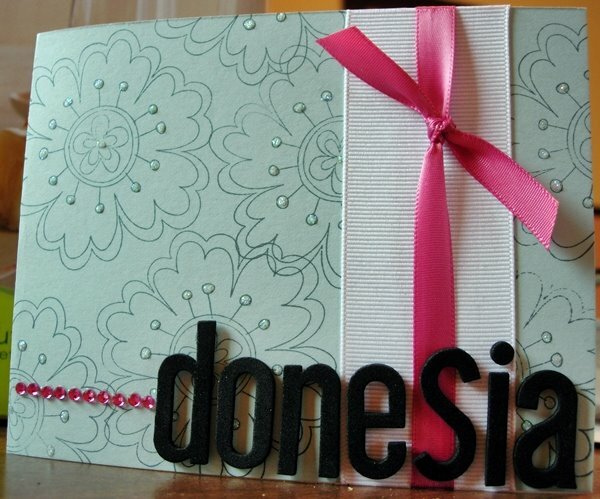 Again, lovin’ that background stamping! We watched the opening ceremony of the 2008 Olympics in Beijing and were just blown away with how much detail and coordination went into each part of it. This Boston Globe article talks about how a Chinese film director, Zhang Yimou, designed and directed the Beijing Olympics opening ceremony with a $300 million budget. Holy crap! This guy’s a friggin artistic genius. I was simply amazed at how beautifully coordinated everything was, and blown away by the sheer number of people involved with each “scene”. I found this video about the dress rehearsal. Can you imagine how much discipline and focus it must’ve taken for all these people to make the show as seamless and perfect as it was? Craziness. Lastly, we went to a wedding shower for our friends, Jill and Drew. It was on the rooftop of their Comm Ave condo building and the view from there was amazing. It’s where I took some fabulous 4th of July firework photos a couple of years ago. The weather couldn’t have been better and it was just fun seeing how excited the two of them are about their upcoming wedding date (October 5th). 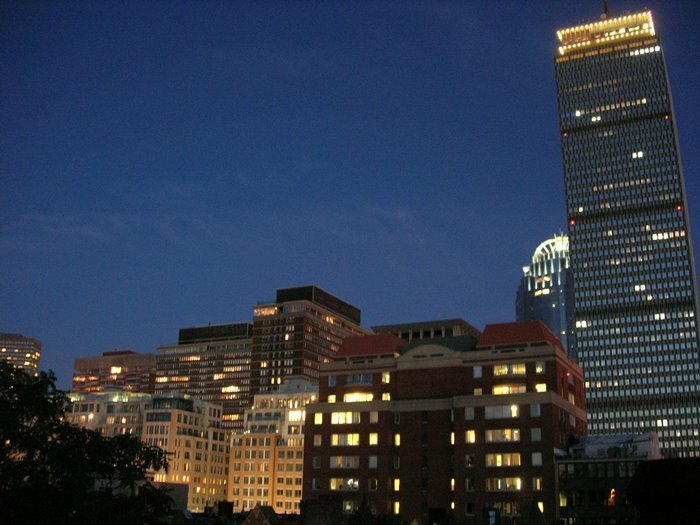 I snapped this photo of the Prudential Tower tonight. This entry was posted in birthdays, Boston, card, cards, Stampin' Up by shortcakescraps. Bookmark the permalink.